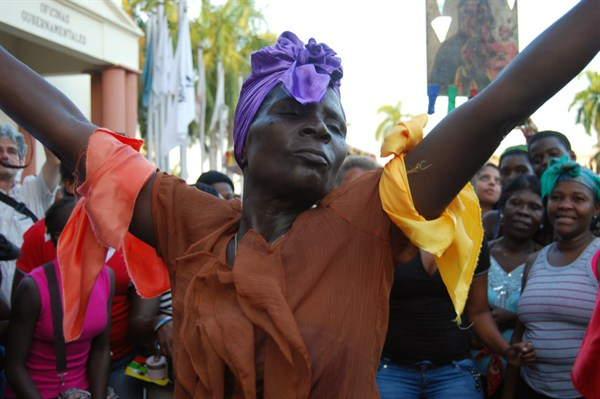 A woman dances to Gaga Afro-Caribbean music during a protest against racial discrimination and “denationalization” of Dominicans of Haitian descent, Santo Domingo, Dominican Republic, March 21, 2014 (AP photo by Ezequiel Abiu Lopez). In September 2013, the Dominican Republic’s Constitutional Court ruled that Juliana Deguis Pierre, who was born in the country to Haitian parents in 1984 and registered as Dominican at birth under Dominican law in effect at the time, should be retroactively deprived of Dominican nationality due to her parents’ migratory status. The decision touched off a political and humanitarian crisis that stretches beyond the island nation’s borders and deep into its political, economic and social history. By judicial fiat, thousands if not hundreds of thousands of undocumented individuals like Pierre were definitively stripped of Dominican nationality, with no immediate indication of an alternative protective status and no further recourse. As in many countries, the lack of documents like birth certificates and identity cards exposes them to immigration control measures, including the risk of detention and expulsion, and severely restricts their access to rights in the Dominican Republic.